Last month after a visit to the McCall Patterns office, here in NYC, I wrote about patterns in the McCall Pattern family that might work with sweater knits. Included in the goodie bag we received at the event was a coupon for one free sewing pattern. I decided to choose Kwik Sew K3916, the "Shawl Cardi". Any of the patterns I examined in that blog post would be a good starting point for a sweater, but all would need to be adapted to really work well, since they seem to have been originally designed and drafted for finer gauged and firmer knit fabrics. K3916 clearly states on the back of the envelope in bold print, "Designed for firm stretch knits." As I make the cardigan over a few weeks, I'll post the modifications I make to the sewing pattern. I was urged to do a sweater knit sew-along via an email I received from a reader after the first time I adapted a commercial sewing pattern for sweater knit use. This won't be a sew-along, just my notes, collected and edited. Except for that aforementioned goodie bag, I haven't been compensated in any way and am not under any obligation to use a McCall pattern. There are hints with K3916 as to how stretchy the knit fabric must be and they're on the envelope and pattern piece. 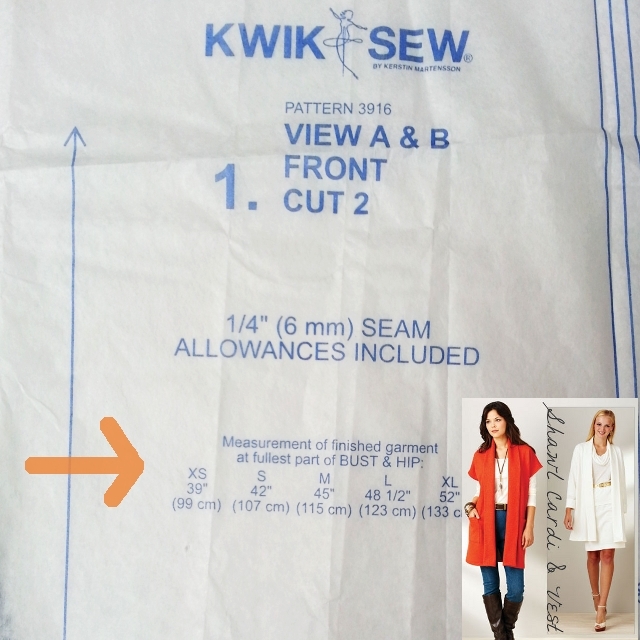 Since the bust (31 ½ - 32 ½ inches) and hip (32 1⁄4 - 34 inches) measurements from the pattern envelope for the XS size, are at least 5 inches smaller than the measurement of the finished garment, as seen on the pattern piece above, there will be a nice positive ease to the garment. Stretch of the fabric will not be a huge factor with this cardi and is probably the reason a stretch gauge wasn't included. Again, sweater knits are not listed as a suggested fabric, but I'm going to make the sewing pattern work for one of the following very different fabrics. My first fabric would produce a cardigan that's similar in look to the envelope pic. The main difference is that my fabric would be a sweater knit jersey, a bulkier gauge with a looser knit. It's a brushed mohair/wool blend, and I'd use the reverse side as the right side. The fabric would be a little heavier than what's on the envelope pic (I think) and definitely fuzzier. My other choice is what I refer to as my sloppy plaid. You may have seen one version of it in my Fabric as Finished Object post. 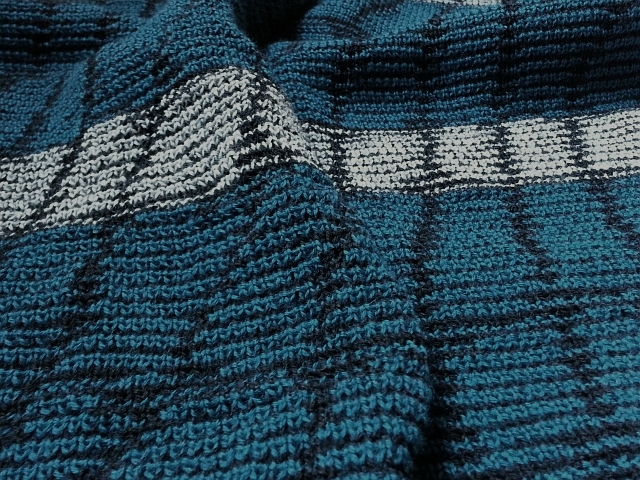 The colorway I'd use for the cardigan is teal, black, and grey. This is a double knit, a jacquard with a stitch pattern that I had a lot of fun designing. The fabric is not nearly as thick and ripply as the one used in the Zipper Ripple Jacket, but it definitely has a textured look and feel. I've already tested sewing through three layers of this merino wool -- no problem. While the white jersey would produce a good basic wardrobe piece, the teal plaid would make a great eye-catching cardigan with its all over unusual pattern. Both fabrics are true sweater knits, stretchy, and not overly unstable. Whichever I chose, I've already decided to use a stretchy Hong Kong finish on all seams, since the inside of cardigan will show when I take it off, and I absolutely love the look of that seam finish. So what will it be? A wardrobe staple (if a cardigan of fluffy mohair can ever be a staple)? Or an off-kilter plaid statement jacket? Any thoughts on which I should choose will be appreciated. Oh, that's a hard choice! A basic is always good to have but I love statement garments too! 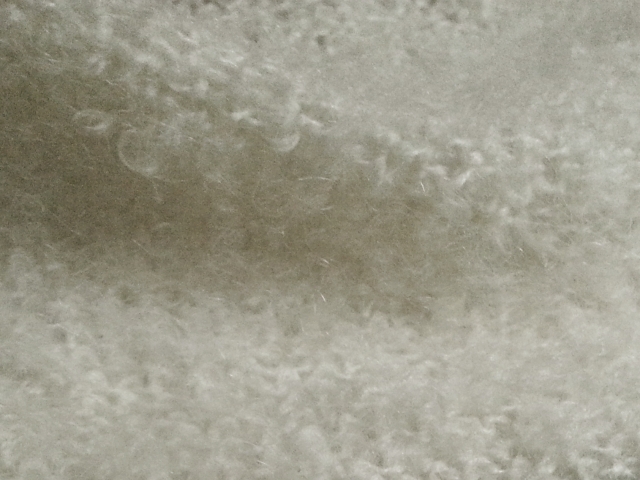 The only reason I think the white basic fuzzy knit would be better is the "fur" look is very current and Fall 2014. You always make the prettiest knit fabrics! White for me too, more versatile! I looked at the pattern and noticed that one of the recommended fabrics was interlock. I think a sweater-knit interlock would make a wonderful drapey cardigan for this. Hmmm... still considering... Thanks for weighing in! I would make it in both! I love the luxury, dressy feel of the white. The statement plaid is cool and would look great with jeans or a black sheath dress. Both sweaters would give 2 completely different looks and attitudes. Eventually, Cheri, I will use each fabric, but I might not use the same sewing pattern for both. I really like your styling idea for the plaid. I think I would make one of each fabric. The white will go with everything and the blue will just be a fun one to have. They are both beautiful. You can't go wrong with either choice. Thanks for the good word, Jeannie! Your vote has been recorded. ;-) I like your styling suggestion, too. Thanks, Chris!